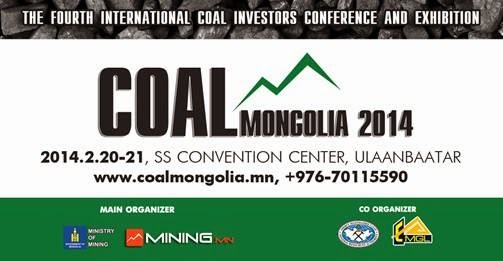 February 13 -- This is a voluntary announcement made by Mongolian Mining Corporation (the “Company”). References are made to the announcements dated 6 October 2011 and 19 August 2013 issued by the Company in relation to the construction of the Ukhaa Khudag-Gashuun Sukhait paved road (“UHG-GS Road”) for coal transportation and the decision of the Government of Mongolia (the “Government”) to purchase the UHG-GS Road. The board of directors of the Company (the “Board”) wishes to announce that on 13 February 2014 Energy Resources LLC, an indirect wholly-owned subsidiary of the Company, has received payment pursuant to the Road Transfer Agreement (the “Agreement”) and the rights and duties of the parties under the Agreement became enforceable. The Agreement was entered on 8 December 2013 between Energy Resources LLC and Gobi Road LLC (an indirect wholly-owned subsidiary of the Company), and, among others, Erdenes MGL LLC, a state owned company incorporated in Mongolia assigned by the Government to take control of the UHG-GS Road assets along with all rights and responsibilities in relation to the operation and maintenance of the road pursuant to Government Resolution No. 299 on “Certain actions to be taken to support coal export” dated 16 August 2013 (“Resolution No. 299”). Pursuant to the Agreement, Erdenes MGL LLC agreed to take control of the UHG-GS Road for and on behalf of the Government from Gobi Road LLC and a net consideration amount of MNT157,847,184,614.57 (equivalent to approximately US$90,323,295.42 at current exchange rate), which is an amount determined by the Working Group appointed by the Ministry of Economic Development of Mongolia, which consisted of representatives of Ministry of Road and Transportation, Ministry of Finance and Erdenes MGL LLC, after taking into account of the inspection of all costs and expenses that have been incurred by the Company in relation to the construction and financing of the UHG-GS Road assets. UHG-GS Road was constructed under the license awarded to Gobi Road LLC and subsequently the Build-Operate-Transfer Agreement between Gobi Road LLC and the Ministry of Road, Transportation and Urban Development of Mongolia dated 9 June 2010 (the “BOT Agreement”) whereby Gobi Road LLC was granted a right to build, operate and maintain the UHG-GS Road for a period of ten years after the date on which it is commissioned for service. The UHG-GS Road was built by 100% investment made by Energy Resources LLC and commenced operations in October 2011. Under the BOT Agreement, Gobi Road LLC was required to transfer all of its rights and obligations with respect to the operation and maintenance of the UHG-GS Road to the Government for nil consideration upon expiration of the BOT Agreement term or the Government had a right to takeover the UHG-GS Road upon payment of compensation at any time before the expiration of the BOT Agreement. Upon completion of the transfer of the UHG-GS Road assets, the Company will continue to have unrestricted access to the UHG-GS Road by paying tariff in accordance with the relevant Mongolian laws and agreement concluded between Gobi Road LLC and Erdenes MGL LLC for road utilization and road maintenance services.